Today, Monday 11th of January, is my first 'real' day of the year. After the whole Christmas thing, the whole New Year thing and a little holiday in Arran, this has been the first chance I’ve had in ages to get myself some juice and have a sit down. Now, is it too late to reflect back on 2009? Are all the lists done? Does everyone know who made the best film and who sang the best song? How skinny should my jeans be? Oh, I don’t know! Damn. I imagine all that stuff is long in the recycle bin but hey, like I said, my year starts today. If there’s a dead horse lying around, I’d sure as hell like to give it a kick too. Last year was fun. Lots happened, lots didn’t happen. I got to go places, meet people, see things, eat, drink, draw, laugh and muck about. I got engaged! I went on about 50 bloody holidays! It snowed! Over the next week or so I intend to post a few top 10 lists and things but on the whole, 2009 gets a thumbs up from me. Yeah, I know the world got itself in a bit of a state but jeez, lighten up. In the grand scheme of things; I went to Oban. 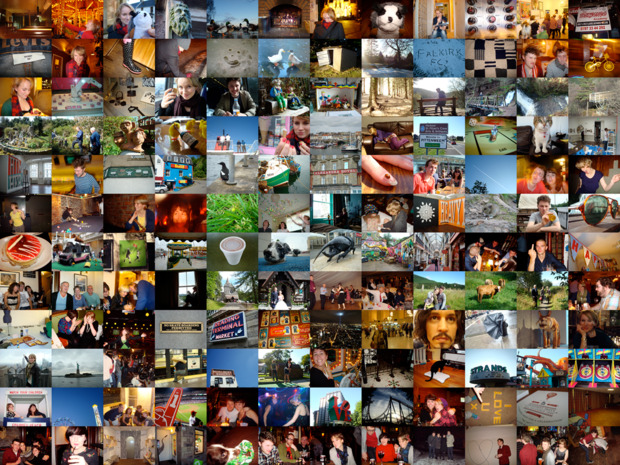 That image above is a chronological montage of my year, like the one I posted last January. It doesn’t cover everything, because I left my camera at home too often, but it’s a good enough place to start. I hope everyone else had a good one. There’s 480 unread blogs in my reader that I need to catch up with. Maybe they’ll let me know what’s up.